Polished brass and steel fireplace mantel, custom-made in 1970 for a waterfront mansion in Palm Beach. Fire box dimensions: 52” wide 38” high. 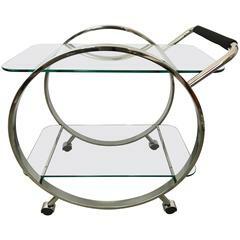 Polished chrome and glass bar cart. Coffee or cocktail table rendered in a top of lacquered Goatskin with cylindrical brass-plated aluminum legs designed by Enrique Garcel, Colombia, 1970s. 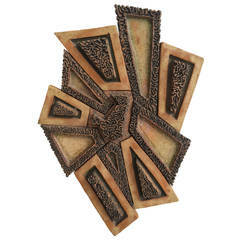 Modernist set of polished stainless steel fireplace tools with stand. Handles feature circle openings to allow them to slide onto stand.